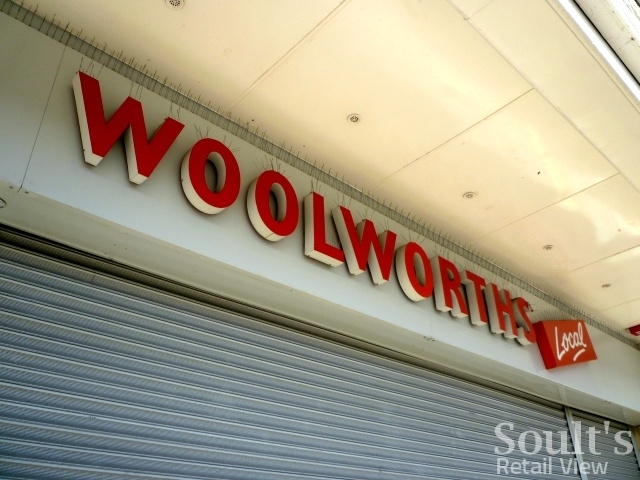 With a dwindling number of empty Woolworths stores remaining in the North East, it doesn’t take too long to check out whether anything’s happening on the ground. I revisited Wallsend’s ex-Woolies back in November, closely followed by Hartlepool and Middlesbrough. This left just Newton Aycliffe, Peterlee and Newcastle to take a look at over the last couple of days, with my visits confirming that all three are indeed still vacant and without any signs of activity. I also called into Seaham – there too, the ex-Woolies building remains empty, though as a result of Ethel Austin’s collapse rather than Woolworths’. 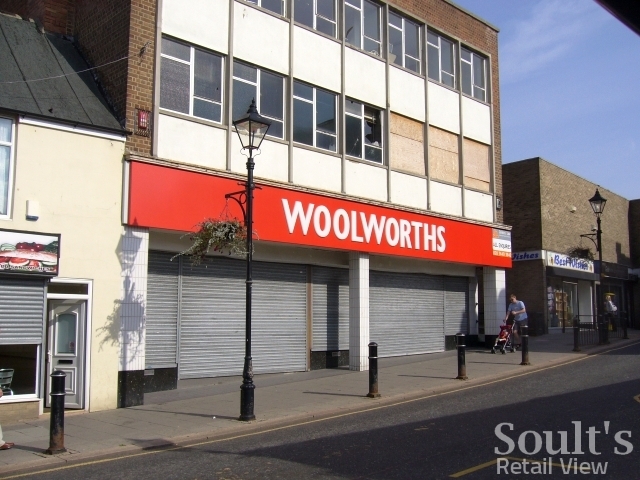 As I’ve blogged before, the property hasn’t housed a Woolworths store for a quarter of a century, though the architecture conveys the shop’s Woolies origins much more than its Newton Aycliffe or Peterlee counterparts. 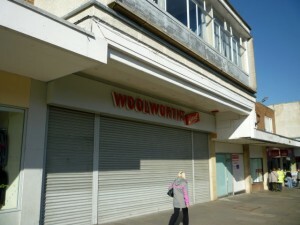 The fortunes of Seaham town centre as a whole seemed even more polarised than on my previous visit. The Asda-anchored Byron Place mall on the seafront appeared to be thriving, with a good number of shoppers and 100% occupancy of its units. 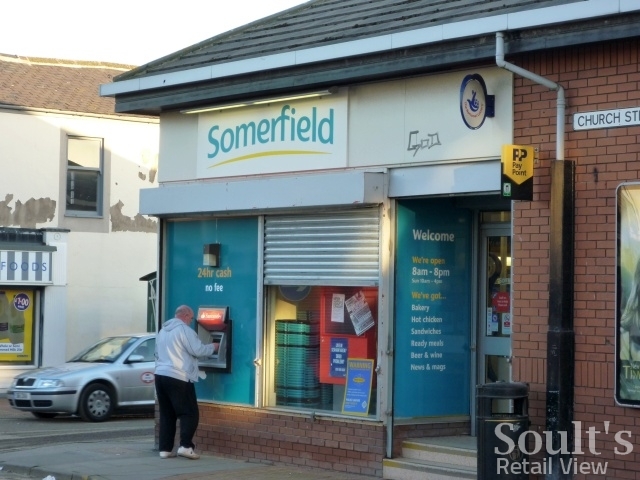 In contrast, the top end of Church Street – the main pedestrian thoroughfare, and where the ex-Ethel Austin is located – was eerily quiet at 5pm, with just a few shoppers venturing into the tatty-looking and partly-shuttered Somerfield store. 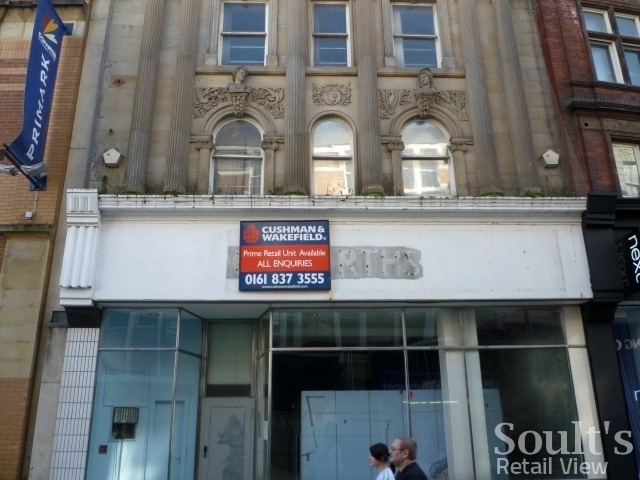 Presumably a Co-operative Food makeover will be forthcoming soon, providing a smarter face to the street and a welcome confidence boost for that end of town. While new occupants of ex-Woolies stores prove elusive for a handful of North East towns, two other places have had a welcome fillip since I last visited. 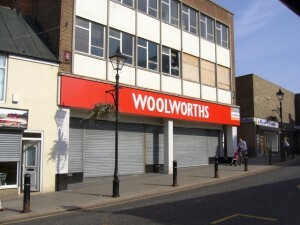 Back in September 2009, the former Woolworths in Houghton-le-Spring, near Sunderland, was a pretty depressing sight (below) with its boarded-up windows and shuttered frontage. 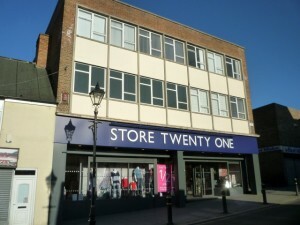 Happily, the premises were taken over by Store Twenty One almost a year ago, and look a whole lot better now than they did on my previous visit. 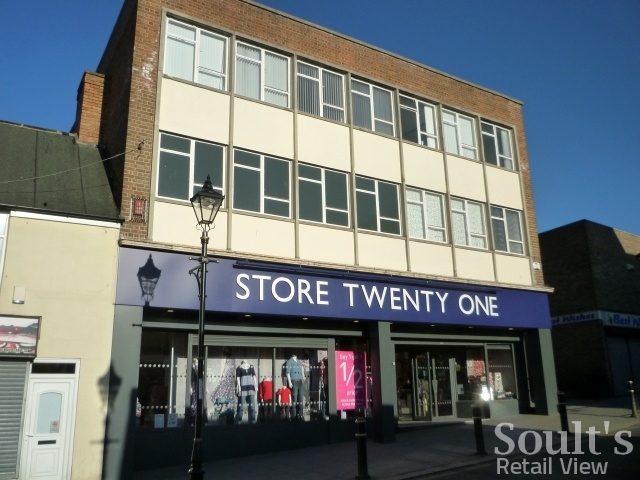 I’d never visited a Store Twenty One branch prior to the company taking over the ex-Woolies sites in Stanley and Jarrow, but I’ve been very impressed with what I’ve seen there and at Houghton-le-Spring. In all three cases, the interiors have been completely transformed, with attractively presented merchandise, good quality signage and an overall fresh and modern look. It’s just a pity that the company website’s “cheap clothes” tagline still rather undermines its impressive efforts instore. Someone needs to remind owners Grabal Alok that retailers don’t sell “cheap clothes” any more – only “value fashions”. 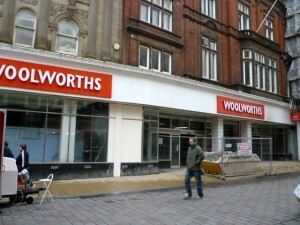 Another ex-Woolies that’s had a fashion makeover since I last visited is the branch at 12-18 Northgate in Darlington, where work on site was underway back in March last year (below). 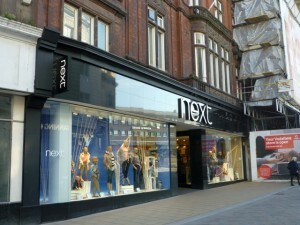 Again, the bulk of the property has been transformed, with Next creating a new store at numbers 12-16 that is bright, appealing, and a really positive addition to the street since its opening last July. 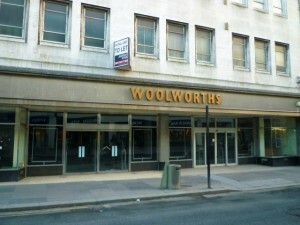 Next door, a portion of the old Woolies – the Grade II-listed number 18 – remains vacant. However, carving it off from the rest of the store does make architectural sense, and allows the merits of its attractive façade to be better appreciated. 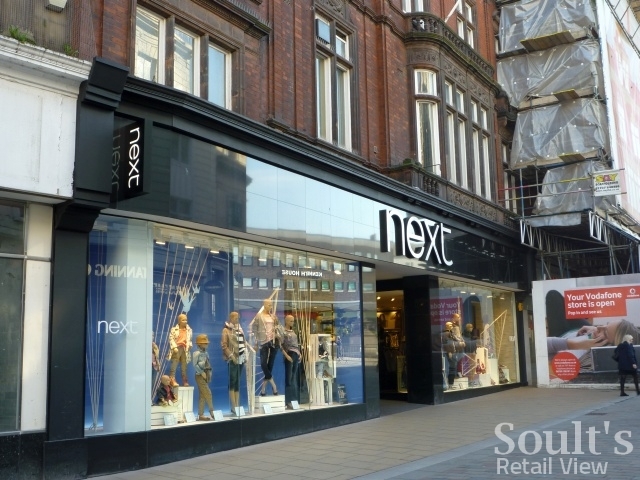 Of course, the flipside of Next’s new store is that the two former Next sites on Northgate have been vacated, both of which are currently empty. The lease of the vacated 1,675 sq ft unit at 59-63 Northgate is currently being advertised by agent Molyneux Rose [broken link removed], while the nearby premises at 21-23 Northgate are empty after hosting a temporary ‘X Factor Factory Clearance’ store. 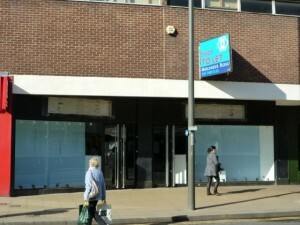 While temporary and pop-up shops have their place on the high street, there must surely be a tackiness threshold above which an empty shop is preferable – particularly when Simon Cowell’s intellectual property is seemingly being so blatantly infringed. 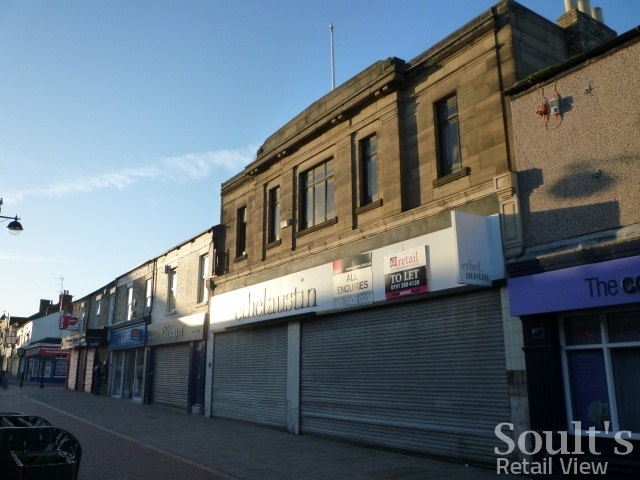 All this shuffling around in Darlington’s Northgate highlights the need to take any statistics on changing shop vacancy rates with a heavy pinch of salt. 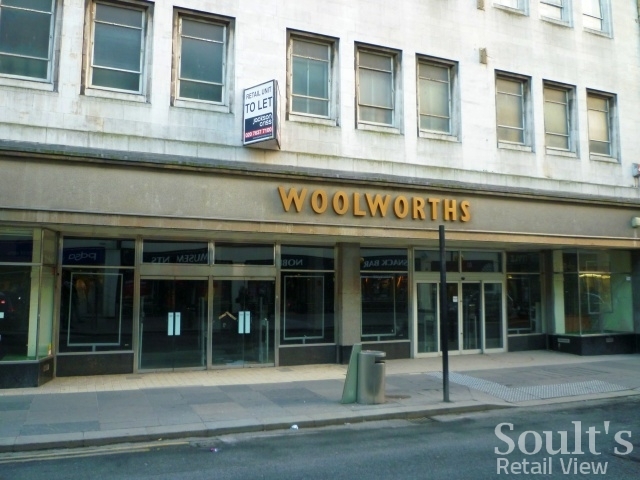 Taking the three former Woolies and Next units together, two were occupied and one vacant when I visited Darlington a year ago. 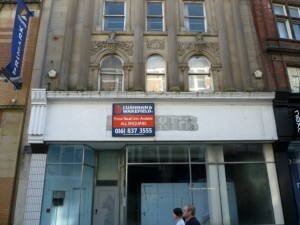 Now, however, one is occupied, two are empty, and another vacant unit – at 18 Northgate – has been created. 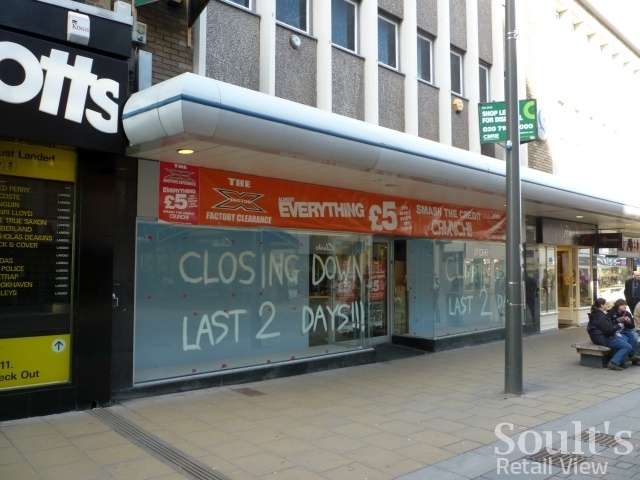 Just looking at the numbers, without any understanding of the context, this reads like a retrograde step in Darlington’s retail fortunes, with three out of the four shops now being empty where previously it was only one of the three. However, most observers would surely see Next’s investment in Darlington as a positive sign for the town – even if this has resulted in some (hopefully) short-term voids. Scary numbers might make garish headlines, but they’re no substitute for actually understanding the places that you’re writing about. Just a quick heads up to let you know that Alworths Llandudno store is closing down, signs are up in the windows, would you like me to get a photo? Hi Dave, that would be great – thanks! I believe Alloa and Evesham are closing too, and Retail Week has published an article this morning under the heading “Alworths in the balance?” – http://www.retail-week.com/city/alworths-in-the-balance/5023127.article. So, something seems to be happening, for sure. 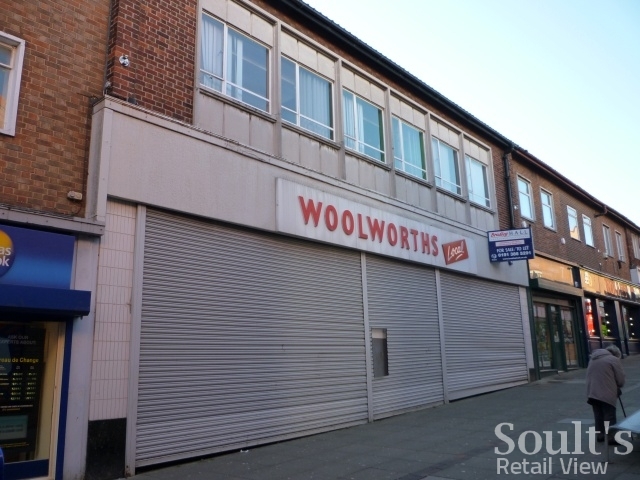 Great post, local to me we had a Woolworths in Shipley which then remained empty for around a year or so before store twenty one moved in and it seems to do a relatively good trade.